Villa Guru is a spacious, serene luxury villa located right on the beach in a protected traditional area, with views of the ocean and sky in all their moods. Built in 2009 and decorated with exquisite detail in contemporary oriental style, the five-star rated Villa Guru has 5 ensuite bedrooms, 18 x 6 metre pool, open plan living and dining area, fully equipped open kitchen, TV/DVD/iPod/stereo system, free wireless internet with 24-hour access and A/C in every room. With a full complement of 10 staff, Villa Guru is ideal for weddings and events and can be rented with next-door Villa Aurora to sleep 18. Completed in 2009, Villa Guru is a two-storey, five-bedroom villa with extensive open-air tropical living spaces, funky interiors and spectacular sea views. Villa Guru is imbued with Asian mystique and decorated in contemporary style. 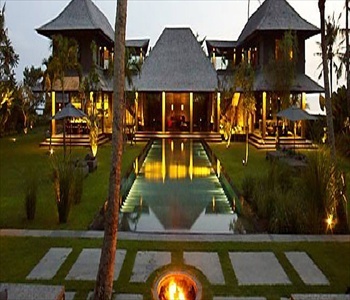 Soaring roofs, interior ornamental ponds, polished dark cement walls and floors are set off with black furniture and Balinese architectural and decorative elements. Small groups of max 10 persons, romantic getaways, weddings and events. Max no. of guests 10. Full house rental: PEAK SEASON (August 2010): 1,050 euros per night, min stay 7 nights. HIGH SEASON (July 2010; Sep 1-15 2010): 950 euros per night, min stay 5 nights. LOW SEASON (dates from April 10th not included above): 750 euros, min. stay 3 nights. Discounts for long stay: 14 nights: 10% discount; 30 nights: 15% discount. Rates per suite per night: Main suites, 350 euros (high season); 275 euros (low season). Garden suites, 250 euros (high season); 200 euros low season. Corner suite: 200 euros (high season); 150 euros (low season). House facilities may be shared with other guests. DEPOSIT REQUIRED: 50% on booking, balance of payment including bank charges to be made min 30 days before arrival. SPECIAL EVENTS: please enquire. GOVERNMENT TAX: 10%. STAFF GRATUITY: 5% service charge is not included in the final bill; a staff gratuity will be much appreciated. Villa Aurora can be rented in conjunction with neighbouring Villa Guru, total occupancy 18 guests. Services offered on request: VIP airport service to avoid long delays at immigration; car and motorbike rental. Special events and dinners catered for; the chef offers international and Indonesian cuisine. Personal trainer; in-house spa services: massage, facial, pedicure, manicure, etc. Nanny service; up to 3 cots for babies can be provided on request. Laundry service. Private chauffeur-driven transport from/to airport available on request. NB: Driving in Bali is on the left.